Most of us make an effort to be eco-friendly at home—recycling, not wasting water, and getting rid of toxic cleaners are all pretty well known ways to go green. But what you might not have considered is that there are opportunities to be just as eco-friendly at work as you are at home. Fortunately, there are lots of ways to make businesses more eco-friendly. Take these tips back to work with you and implement them in your office to help make a lighter impact on our environment! 1. Go Digital – Printing wastes paper, so try to do so as little as possible. Send documents via email instead of using hard copies—there are even programs that let you sign documents online so you don’t have to print them out. Empire Today is one of multiple retailers that offer to recycle old carpet and flooring after new installations, making it easy for your business to contribute to a cleaner environment while enjoying fresh new flooring. 3. Choose Green Products – Another environmentally friendly remodeling option is to choose sustainable materials for new floors and windows. Empire Flooring offers natural, eco-friendly floor materials like bamboo and cork. Both bamboo and cork are renewable and recyclable, and no trees are harmed in manufacturing cork. Empire Today also provides energy efficient window treatments that reduce harmful UV rays and ensure healthy air quality. 4. Unplug Everything – You stop using the things in your office as soon as you leave for the day, so why should they stay plugged in all night? Before you go home, shut down computers, unplug printers, and turn off lights to save energy. Using one power strip for multiple appliances makes it even easier to unplug at the end of the day. 5. Get a Plant – Putting a plant in the office increases air circulation, decreases air toxins, and helps reduce eye irritation from staring at a computer screen for hours at a time. Plus, it can make your office feel a little more like home! Just because you don’t live in your office (hopefully!) doesn’t mean you shouldn’t look for the same opportunities to go green as you do at home. Making environmentally conscious business decisions, especially with big projects like remodeling, can have huge impacts on clearing out landfills and creating a greener, cleaner world. 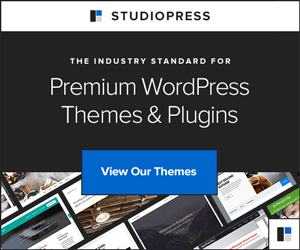 « Grab StudioPress Savings While They Last!